When Charles Vann, Jr., who moved to Aberdeen Gardens in 1939 at the age of seven, drives down neighborhood streets, there is hardly a corner where he does not find someone he knows. Today, the neighborhood is the antithesis of anonymous suburban sprawl-Vann beeps at friends driving in other cars and stops to talk to people mowing their lawns; neighbors he has grown up with and gotten to know in the 61 years he has spent in the community. Even beyond Vann's extensive network of relatives still living there, he is part of a community that remains deeply interconnected. Between 50 and 60 percent of the original 1930s family members or their relatives still live there-- "'originals' as we like to say," Vann said. "We're still just as tight as ever...The community has always been that way in terms of togetherness." 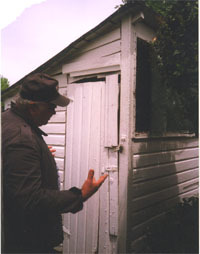 Project manager William R. Walker, Jr.'s house. One example of this continued civic activity is the Yard of the Month contest. Each month, neighbors engage in fierce competition over who can maintain the best garden. Vann can point to winners past and present, and even remembers the runners-up. The Aberdeen Historic Civic Association is a thriving group with about 42 active members. This is a town where neighbors look out for each other. People routinely check on older residents (Tracey, 114). The Association meets the third Saturday of every month, except December, and generally watches out for the community's interests. Right now, the community is in the process of building curbs and gutters on its streets, amenities they were not built with. Vann with sole surviving chicken coop. Reminders of Aberdeen's past are everywhere. Although the areas surrounding the town are developed, the garden spots are still there and there is even one original chicken coop. But the residents also play an active part in making sure their heritage is preserved. In 1994, when rumors circulated that the city would be damaging some of the lots to widen a road, the residents organized to get the community placed on the both the Virginia (March 10) and the National Register of Historic Places (May 26). Support for the move was widespread-250 residents attended a celebration when Aberdeen was placed on the Virginia State Register of Historic Landmarks. In a pamphlet the Association put out about the project, there is nostalgia coupled with urgency. The group said they were trying to preserve a community that had "the open space folk dream about today, rather than some type of structure on every blade of grass... The big horror was the encroachment, creeping like a snake until it had surrounded Aberdeen Gardens." The origin of the Association was a community softball team called the Aberdeen Rattlers, several original residents. Vann, part of the softball team, said the community was not eligible for the historic designation until 1987, when it turned 50 years old, but the road widening "triggered us that if we didn't get moving [further development] could easily happen." The Association hopes to build a new community center sometime in the near future, as well as open a museum. End of the day at Aberdeen School. We hope to get a community center and we're trying to get it located on school grounds. We don't have adequate facilities for our youth, particularly outdoor sports and in doors during the winter months. We have five basketball teams and normally about 300 cheerleaders-we fill up the school yards," Vann said. Vann also said the planned museum, to be located at 57 Mary Peake Boulevard, will be a replica of one of the 1930s houses, complete with original bricks, screens and garage door. The city approved $50,000 for a renovation program this year, and $50,000 for next year. Vann also said the Association has collected enough original artifacts from other houses, like radiators and heating systems, to make the house totally authentic. Residents have been protecting Aberdeen long before the Association organized. When developers wanted to build behind Langston Boulevard, they organized to prevent the plans. "They had a meeting and the developers wanted to buy everybody's back lot. So we had a gentleman on the corner who was like the mayor and he was very vocal. His first question was to the developer, how much do you plan on paying for the lots and the developer came back [and said] we thought $300 dollars was a good price and everybody rose in the church, and the meeting didn't last five minutes," Vann said. "So the old-timers had a great part in not wanting the encroachment." The residents who unified to protect their neighborhood think of it as a place where self-reliance was the rule despite its origins as a New Deal town. A pamphlet listing reasons that Aberdeen should be preserved stated that, "Its inhabitants were hand-picked to live in this neighborhood because of their integrity, willingness to work, and support their own families and their ability to stand on their own rather than dependence on the government." Aberdeen Gardens had also been the home of some famous people. Hazel O'Leary, President Clinton's first Energy Secretary, grew up at 16 Langston Boulevard and basketball star also Alan Iverson grew up in East Aberdeen. After the Association's success in putting Aberdeen on the historic map, the challenge for residents now comes in the form of motivating the next generation to carry on the tradition of community. Vann said that despite efforts to include youths in Association activities, the residents who are interested in Aberdeen are by and large older. "Our youngsters just aren't into community organizations," he said. But Vann also said he hopes that as the Aberdeen children grow up, they will also realize what a unique history they share. "It's an educational thing. We think that as they mature they'll get into it. You see, we have Americans right now who are not really into history. They think everything has been this way all the time, and I guess when I was a kid I thought the same way," he said. And in the end, it was the residents who ensured Aberdeen Gardens' success during the Depression, and it will be the residents who will be responsible for its future. "I think the community really succeeded because there were a lot of people who really enjoyed it. There were a lot of people who were relatives, but there were a lot of people who grew to be just like relatives by being around each other," Vann said. "The community was doing more than fitting a need--it fit the human side by creating relationships. We stuck together all these years."